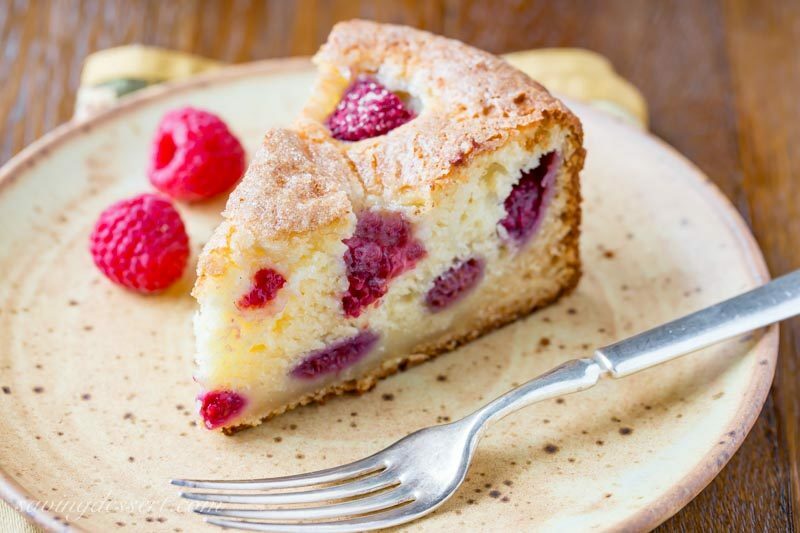 Raspberry Ricotta Breakfast Cake – A deliciously moist and fluffy, berry-streaked breakfast cake perfect for dessert, breakfast, brunch, or afternoon tea. It’s time for another installment of … “if I owned a Bed &Breakfast, I’d serve this lovely cake to my guests!” Thank goodness I don’t own a B&B because I would hate to have to clean house every single day and changing the sheets more than once a week is not my style. However we do have our fair share of out-of-town company and, from time to time, enjoy sharing a little something sweet with our guests. One of our favorite recipes for company is this Blueberry Breakfast Cake stuffed with a full 2 cups of fresh blueberries and plenty of tangy buttermilk. Another popular favorite is our Lemon Crumble Breakfast Cake with loads of lemon flavor and a sweet crumble top. For the holidays, we love to share this Cranberry Almond Breakfast Cake made with almond paste and almond extract, so delightful! I’ve been experimenting with ricotta cheese lately and in the next few weeks will share some really great new recipes. This is the first of many recipes I hope will become staples in your home too. I’m absolutely smitten with the texture ricotta gives baked goods. 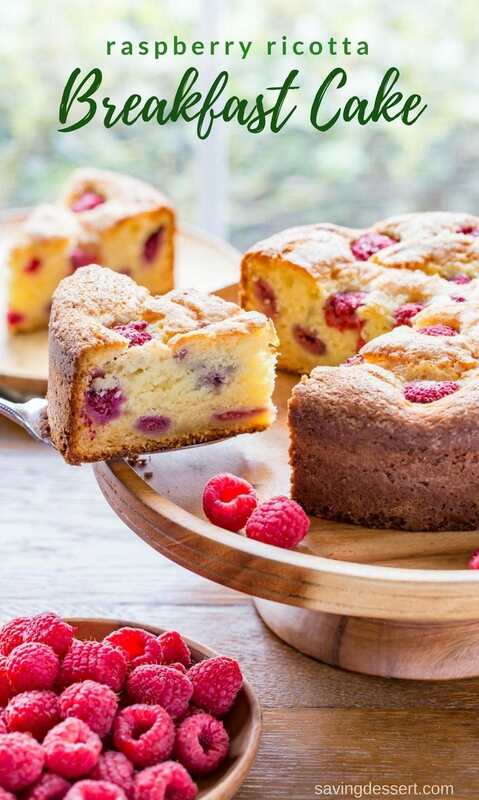 Our golden brown Raspberry Ricotta Breakfast Cake is super moist, but not at all wet. The texture is almost a cross between cake and cheesecake and our taste testers went on and on about how much they loved it. Our son, who is often my toughest taste tester, said this cake was good, then he went on to add he thought it was “really good.” That’s high praise indeed! I’ve tested this cake with fresh and frozen raspberries. There isn’t a huge difference but think I prefer frozen raspberries for this recipe. Raspberries break down quickly when cooked and can turn to mush in baked goods. Starting out with frozen raspberries helps them stay in one piece throughout the baking process. The tart raspberry flavor really stands out and this cake is incredibly delicious served slightly warm. Sometimes it’s hard to reduce the amount of sugar in baked goods, especially cakes. As you know, sugar turns into liquid when heated so the less you add, the drier the cake may be. However, this lightly sweetened cake has the perfect balance of sweet and tart flavors and is not at all dry. Adding a little coarse sugar on top really gives this cake that something extra. You won’t need to top this cake with powdered sugar, drizzled icing or even whipped cream. It’s really great straight out of the oven, served slightly warm. I love the little crunch on top and hope you do too! 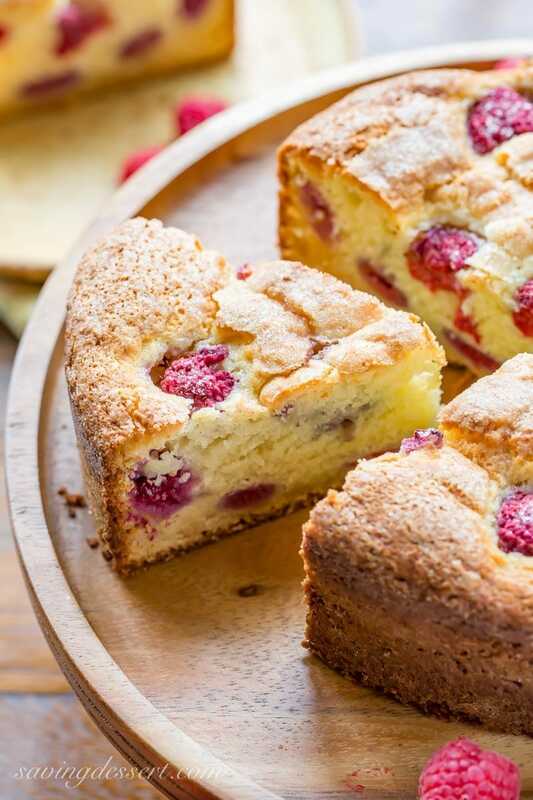 Raspberry Ricotta Breakfast Cake - A deliciously moist and fluffy, berry-streaked breakfast (coffee) cake perfect for dessert, breakfast, brunch, or afternoon tea. Invert the bottom of an 8-inch springform pan and line with parchment paper. Attach the sides of the pan and lightly grease and flour the sides and bottom. In a small mixing bowl combine the flour, baking powder, salt and baking soda. Whisk to combine and set aside. In the bowl of a stand mixer, combine the butter and 3/4 cup of sugar. Beat for several minutes or until light and fluffy, scraping down the sides as needed. Add the eggs, one at a time, beating well after each addition. Add the vanilla and blend until incorporated. Add 1/3 of the flour mixture to the creamed butter and sugar. Beat on low until incorporated. Add 1/2 of the ricotta and blend until smooth. Repeat adding 1/2 of the remaining flour, then all of the remaining ricotta. Finally, blend in the remaining flour. Scrape down the sides of the bowl and fold gently with a spatula to ensure the batter is well mixed. Pour 2/3 of the cake batter into the prepared pan and top with 2/3 of the raspberries. Layer the remaining batter on top of the raspberries and smooth the top with an offset spatula or the back of a spoon. Finally, scatter the remaining raspberries on top of the batter. Gently press the raspberries about halfway into the batter to secure. Sprinkle the coarse sugar on top and bake in a preheated 325 degree oven for 60-75 minutes or until the top is lightly browned and a toothpick inserted in the center comes out with no wet batter, moist crumbs are fine. Cool at least 20 minutes before removing the sides of the pan. Serve slightly warm or at room temperature garnished with fresh raspberries if desired. The batter will be very thick, but don’t worry - the cake is light and moist. If using a dark colored pan, bake at 325 degrees. If you have a light colored pan or prefer to bake in a 9-inch cake pan with 2-inch sides, you can bake at 350 degrees and check the cake after 45 minutes. If using salted butter, omit adding the 1/2 teaspoon of salt. I love baking with raspberries and if you do too, check out this easy recipe for Raspberry Scone Cookies from Barefeet in the Kitchen. For a beautiful spring brunch, lunch or Mother’s Day, I would love to make these Raspberry Lemon Cupcakes from A Spicy Perspective. You won’t want to miss these gorgeous Raspberry Gooey Butter Bars from Chelsea’s Messy Apron – they are a must make recipe! Finally, these No Bake Raspberry Cheesecake Bars from The View from Great Island would be perfect for any occasion. Hi Ria! I think cherries would be great in this cake in place of the raspberries. Good luck and thanks! I’ve baked this cake for two hours and the center still isn’t done. It’s back in the oven but at this point I don’t expect success. I wonder if the raspberries were too moist to allow the batter too completely bake. I’m sorry you’re having trouble Brenda. I can’t imagine why it’s not baked through. I’ve made variations on this cake numerous times, with blueberries, cranberries, lemon, strawberry, peach etc. but have never had it not bake well. I’ve made this recipe several times, but prefer using frozen berries (not thawed) as fresh will break down too quickly. I use full fat, thick ricotta cheese. Did you use a low fat version or anything? Could you develop this with cranberries? Perhaps with lemon flavoring? Hi Kathie. I have a Cranberry Almond Breakfast cake that we just love. However, feel free to substitute cranberries for the raspberries in this recipe. You can also add some orange zest and a little juice if you like. We adore ricotta cakes and this one is a keeper. Click HERE for the link to the Cranberry Almond Breakfast Cake. Thanks! This cake is so beautiful Tricia! I am making one right now to take over to a friends house for breakfast who is home from surgery. What better way to start the day than to share such a lovely breakfast cake with a friend! Ricotta is so wonderful in baked goods and pancakes!! YUM! Thank you for this recipe! ???? Hello Ms. Tricia, Looks perfect! I want to give it a try but nobody in our house likes raspberries. Could we substitute with blueberries? Thank you for such amazing recipes, we really enjoy them. Hello Rose! Yes – blueberries would be wonderful in this recipe. I would use fresh as frozen tends to streak blue all over the batter. Good luck – hope you love this as much as we do! The texture is amazing, Tricia! Very much like a sour cream cake that I love. This would be perfect for Easter! Thanks Susan – I have to check out your sour cream cake – yum! Absolutely gorgeous. Have you ever used dried raspberries that keep their shape? They look almost freeze-dried, but I can’t remember. I bought mine at Nuts.com. I couldn’t have a B and B either. Ugh. Hi Mimi – I have not used dried raspberries but looked for dried strawberries on many occasions. I will have to look on Nuts.com. I wonder how they would do in this recipe – sounds interesting! I am adoring this cake! I love starting the morning with something sweet and this is perfect. Maybe not for my waistline, but I’ve let that slide for a long time! Pinning this! Love ricotta cakes and pinning this one!! Thanks Anna – pin away! I can’t think of a nicer way to start the day. Yum. 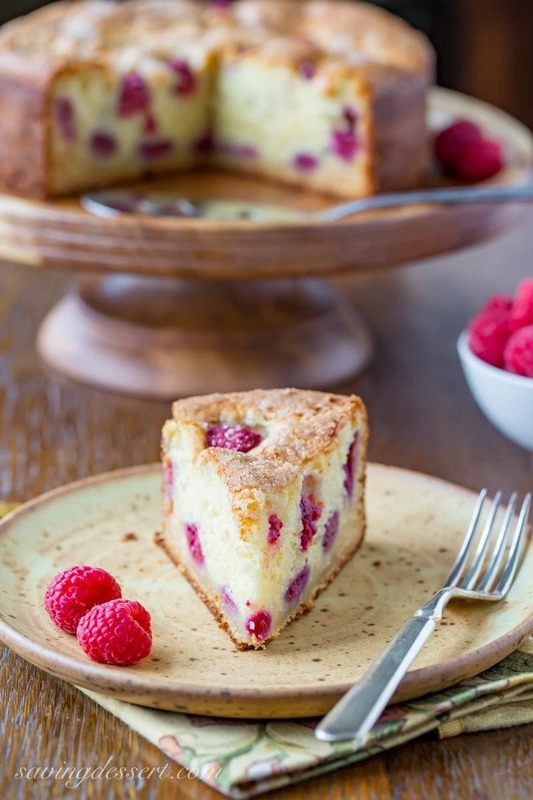 I can never resist any baked goods containing raspberries and this gorgeous breakfast cake would be perfect morning, noon and night!!! Yes indeed! Thank you Greg – enjoy the rain. This cake is so versatile, Tricia, but definitely a great company breakfast sweet for sure. I have become such a raspberry fan and I’m happy to hear you actually prefer using frozen here because that’s just so convenient. I’m also intrigued about using ricotta in cakes! It has been a stormy day here…would be so nice to cozy up any time of day with a big slice of this and some coffee. Thanks Monica – you’re going to love using ricotta in baked goods, hope you’ll give it a try. Hope you didn’t suffer too much with the big storm Riley – we lost power for 24 hours and boy was it cold. Thanks! Hi Kathleen! Great question. I think this would be fine to make ahead and freeze, however the top will be a little more soft than fresh baked. Make sure it cools completely before wrapping and freezing. I baked a similar cake today Tricia, great minds think alike. Your cake looks delicious and so yummy. I like the addition of ricotta cheese. That must make this cake real moist. Pinned! Absolutely! I can’t wait to see your recipe. You’ll have to try the ricotta trick sometime – such a lovely addition to baked goods. Happy weekend Gerlinde! I am muh more this kinda cake than an icing kind of girl:) Lovely!I Pinned another one..today or yesterday..yesterday ..along these lines too..:)Thank you! Thanks so much for pinning Monique – and I love these kind of cakes too. Hope you get the chance to make it sometime! Having company this weekend and now I know what I’m going to make for the morning, this lovely breakfast cake. You always come up with the best goodies Tricia! Thanks Emily – we love it! There’s nothing better than the flavor of fresh raspberries, this looks so good Tricia, I would kill for a slice right now. I bet the ricotta gives it great texture! Thanks Sue – I am in love with the ricotta, it’s takes this cake over the top! I could go fo a slice of that as I’m sipping this mornings coffee. It’s an easy recipe Larry – bet you could make it! I would probably snack on this cake all day long until it’s all gone! It looks gorgeous, Tricia. Thanks Angie – this recipe is a winner at our house. Served warm, it’s just crazy good and seems to get better the next day! I love ricotta cakes! Such a fabulous texture and a nice change from the usual. And raspberries are a perfect complement. Beautiful! I think this fabulous cake would also make a wonderful dessert after a nice dinner and a delkicious midday snack. Maybe it needs to be called Raspberry Ricotta Anytime Cake!